Ranieri Boats never fail to amaze us. 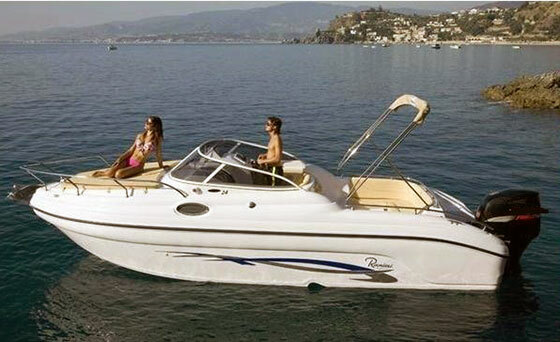 Just take a look at the pictures and see the specifications of this 24 foot boat which is fast, comfortable, and fun. Overnighting is possible while it boasts both an outside wetbar and a kitchen in the cabin. The Sea Lady 24 is an affordably priced 24-footer sport cruiser with a couple of design features seen in the other two boats from Sea Lady series. Thanks to its particular architecture and symmetrical arrangement, the Sea Lady 24 is for anyone who is looking for height, performance, security, precision in handling, and fun in fast driving. Besides it's speed and easy handling qualities, she has reached a high level of reliability and structural robustness. 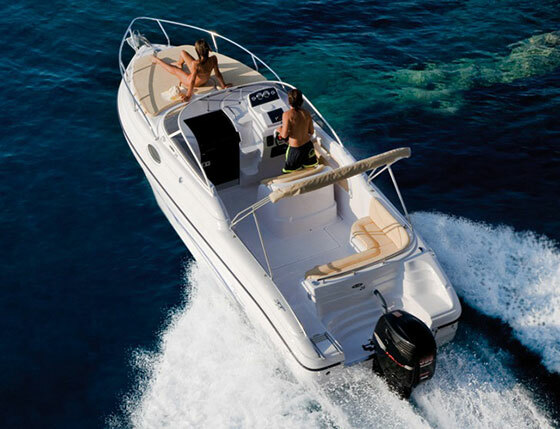 Sea Lady 24 has a sporty cabin with a spacious and functionally organized inner area. The layout include sleeping places for two, small galley (stove, sink and refrigerator), a removable dinette table and a head with shower. The wrap around windscreen enhances the modem line of the deck from which it is possible to access, through a stair obtained from the console, the wide sunbathing area at the bow under which there lies the cabin porthole. The elegant helm console along with a carbon steel and briar wood instrument panel was intentionally designed to guarantee every comfort and to ensure a great holiday at sea. The Sea Lady is available in both outboard and inboard versions with a variety of Mercury/Mercruiser engines up to 300hp.